The Trans-Pacific Partnership is an example of why free trade came to have such a bad reputation with the American public. Rather than a simple agreement to lower tariffs for mutual benefit, it morphed into a massive international regulatory regime over 5,000 pages long. It was weighed down by numerous non-trade provisions aimed at appeasing non-trade special interests. To be sure, there may be worthy environmental and labor issues worth addressing through international agreements, but these should be considered in separate treaties and have no business being part of trade negotiations. Instead, the TPP went down the road of regulatory harmonization, a good-faith effort to tackle non-tariff barriers to trade that became hostage to special interests. Moreover, the complexity of the regulations meant that there needed to be an investor-state dispute resolution process, whereby companies that had invested in a country on the basis of the agreement could sue the country for redress of grievances if the regulations weren’t properly applied. The presence of these processes led to accusations that the TPP was “corporatist” and that it was anti-democratic, putting corporate interest above national legislation. Meanwhile, NAFTA, which comes from a previous generation of trade deals, has some of these problems (there are certain labor and environmental standards in the agreement) but not to the extent that it harmonizes regulation. 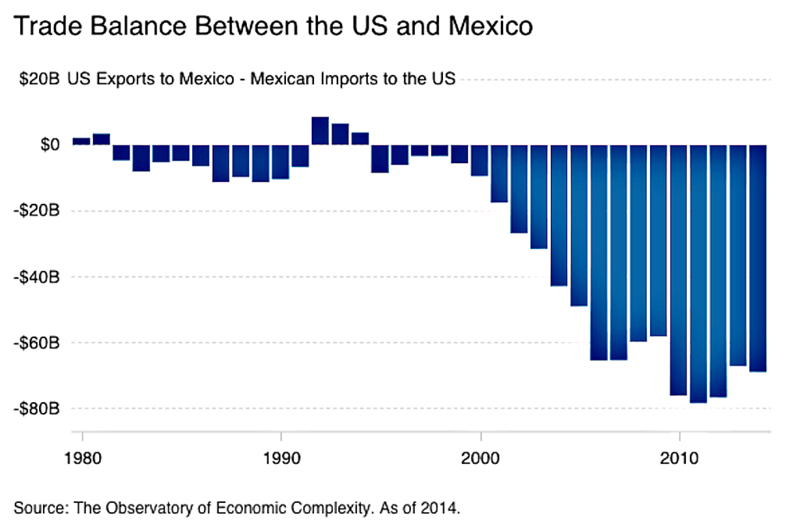 Instead, what may have happened over the years is that companies might have been forced out of the U.S. to Mexico by America’s hyper-regulation (the chart below, from a CNBC story, shows how the balance of trade with Mexico gets much worse after 2003, a time when there appears to have been a steep change in the cost of regulation in the U.S. – see Table 2 in Ten Thousand Commandments). This is not to say that NAFTA has not been beneficial – it has been overall – or that the TPP’s tariff reductions would not have outweighed the regulatory burden. Yet it is clear that the opposition of both main candidates in the recent election to the TPP (and we should also remember that President Obama promised to renegotiate NAFTA) suggests that trade deals like the TPP are no longer feasible. [H]armonization can lead to conformity and stagnation – resulting in superior alternatives not being explored. Rather, policymakers should look to competition among regulatory regimes. This “discovery process” is a better way to reduce transaction costs and thus increase voluntary wealth creation. Providing companies with a choice of regulatory regimes often works better than a single uniform regulatory structure or a harmonized system. Centralized regulators can suffer from limited information and pressures from special interest groups. Dispersed regulatory structures can satisfy different preferences, try varied approaches to regulating, gain information about what works and what doesn’t, and provide feedback to learn more about the cost effectiveness of specific rules. Regulatory competition provides these benefits. Goods legally sold in one country can be sold in the other. This principle operates regardless of different standards, or other sale-related regulatory requirements between New Zealand and Australia. Someone registered to practice an occupation in one country is entitled to practice an equivalent occupation in the other country, without further testing or examination. Such an agreement would probably work very well between the U.S. and Canada – and, indeed, between the U.S. and both Australia and New Zealand in the Trans-Pacific context. Mexico, on the other hand, would probably have to significantly improve its standards before becoming eligible for such mutual recognition. In particular, regulatory competition does not require an investor-state dispute process. All disputes are handled by the appropriate country’s legal system. This requires a strong commitment by the country to such basic ideas as rule of law, enforcement of contracts, property rights, freedom from corruption, and so on. Countries like Mexico and Vietnam have a way to go in this area – they rank 62nd and 131st respectively in the Heritage Foundation Index of Economic Freedom. Australia, New Zealand, Canada, Chile, Singapore, and Hong Kong, on the other hand, all rank highly – 5th, 3rd, 6th, 7th, 2nd, and 1st respectively in the Heritage Index. Indeed, they are better than the United States, which is now ranked 11th. A series of mutual recognition agreements with these former TPP countries would effectively form the nucleus of a Global Free Trade Association that would provide a beacon of light for countries that want to improve trade by improving their governance. In short, the decisions to end the failed TPP experiment and perhaps pull the plug on NAFTA may not be the disaster for free trade they seem like at first blush. Such a radical rethink of trade may have free traders celebrating after all. — Free Traders Shouldn’t Mourn the Loss of the TPP originally appeard at FEE.org.